Having more of a savoury than a sweet tooth, I’ve long enjoyed a good savoury muffin. 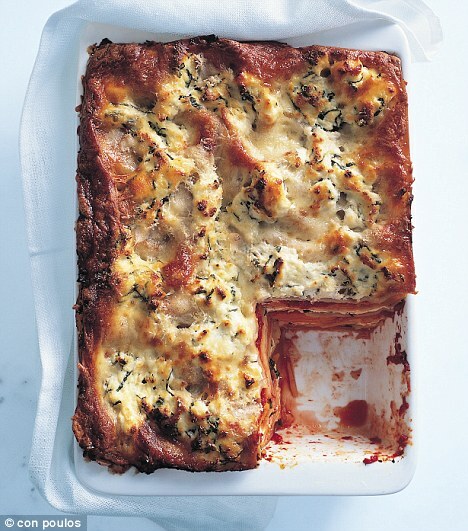 Aside from the wide variety of possibilities when it comes to flavour, they are a terrific option any time of year – another alternative to sandwiches for kids heading back to school, or a yummy accompaniment to a BBQ dinner or a bowl of soup (with a bit of real butter on the side too). They can also be a just meal of their own. Savoury muffins are healthy, tasty, filling, very forgiving when you have to fudge the quantities, inexpensive, and best of all, freezer friendly. I love how easy it is to grab one of these from the freezer, and place once more in a warm oven for 5 minutes – bringing them pretty much back to newly baked awesomeness. Julie Morrow has contributed a couple of wonderful recipes that you’re sure to enjoy, each first published by Hugh Fearnley-Whittingstall in The Guardian Australia. She suggests, and I wholeheartedly agree, adding 100g of fetta to the top of each muffin, and my hot tip for this (discovered by my thrifty husband Steve) is the Coles brand of Marinated Danish Fetta – pictured above. It’s EXACTLY the same as the South Cape variety (even the jar is the same), but costs $5.40 per jar, as opposed to almost $12). First up from Julie are these fluffy, moist, flavoursome and vegetarian friendly babies. This recipe makes 12 and costs less than $5. Warm the 10g of butter in a large frying pan and sauté the onion with a pinch of salt until soft and translucent, about 10 minutes. Add the cumin, stir for a minute, then add the spinach and stir until wilted and soft. Cool. In a jug, whisk the melted butter, eggs and yoghurt. Pour the wet ingredients over the flour and stir with a spatula until just combined. Fold in the cooled onions and spinach, the carrots and seeds. Spoon into the cases crumble the fetta evenly atop each portion. Bake for about 18 minutes, until a toothpick comes out clean. 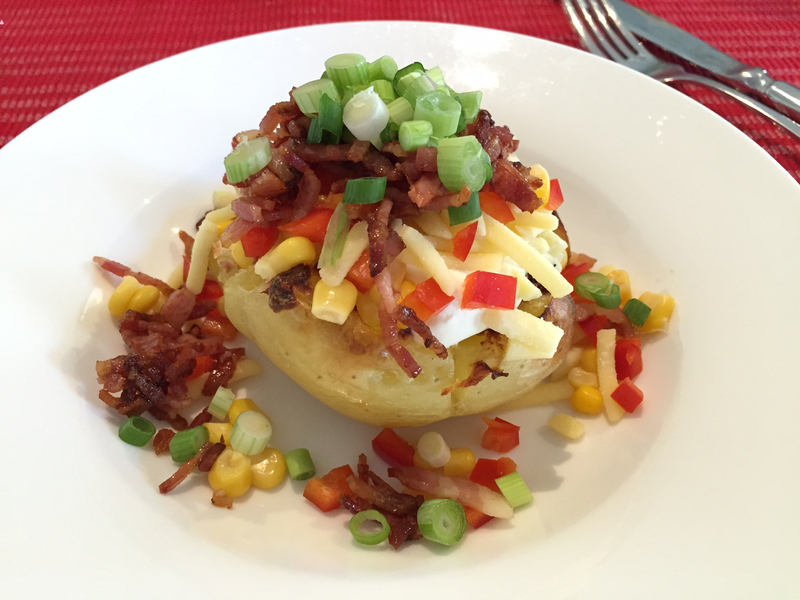 Whether you need a cheap meal for a crowd, or a slack dinner at home or an easy way to satisfy a Zambrero’s-type craving, these yummy Mexican style jacket potatoes are a great choice. They’re wonderful for satisfying other catering needs too: they can easily be served as vegetarian and are wonderfully gluten free too. Cheap to make, easy to whack together and super yummy, 8 of these fat babies with the ingredients pictured cost less than $10 to make and serves 6 people. Preheat oven to 200 degrees. Prick potatoes all over and par-boil in a large pot of water until soft, (the time this takes will depend on the size of potatoes), drain water. Place each potato inside a large roasting dish, and using a potato masher, press down gently but firmly on each one until it squashes/smashes nicely. Cover in spray oil and what in the oven until golden, about 20 minutes. 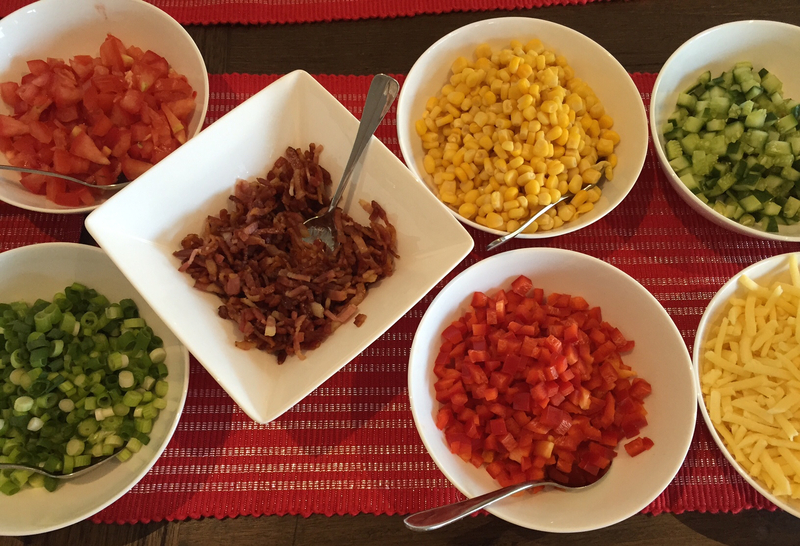 Organise whatever toppings you’ve decided on – chop and fry bacon and quickly chop up vegetables of choice. Take all ingredients to the table and allow friends and family to assemble their potatoes as desired. It was so lovely catching up with my friend Katrina last weekend. Over lunch she raved about this healthy and easy dinner she’d recently tried out and by the end of her description I was keen to give it a go too. I don’t find it easy to cook tasty vegetarian dishes, and have felt the need to have a few more recipes of this kind up my sleeve when caring for vegetarian folk. And Katrina was right – this little number ticked all the boxes: easy to cook, healthy in nature, tasty, affordable and freezable. 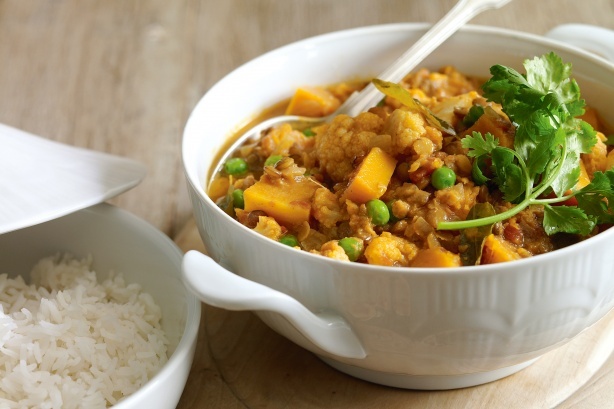 To lower the GI, carbohydrate and fat content, Katrina helpfully suggests replacing the pumpkin with sweet potato, leaving out the cream altogether and serving it without rice because this curry is nutritionally complete on its own. She also suggested a dollop of greek style yoghurt on top which tasted great. Originally from Notebook Magazine, when served with rice, this vegetarian dish serves 6 people and costs around $7 to make. Heat oil in a large saucepan over medium heat. Add onion and cook, stirring, for 3 minutes or until onion softens. Add curry paste, curry leaves and ginger and cook, stirring, for 1 minute or until aromatic. Add tomatoes and water and bring to a simmer. Add combined lentils and cook, stirring occasionally, for 15 minutes or until lentils are almost tender. Add the pumpkin and cauliflower and cook, stirring occasionally, for a further 10 minutes or until pumpkin is tender. Add peas and cream and stir to combine. Remove from heat. Taste and season with salt and pepper.